The initial release in a four-part series, the first chapter of the Renaissance has been bottled at 15 years of age. Showcasing Glen Garioch's deliciously different house style following its re-awakening in 1997, this first chapter in a four-part story reveals the spirit's character at 15 years old - rich and full-bodied with fruit and spice. First Chapter is an unpeated 15 year-old Single Malt scotch whisky matured in bourbon and Sherry casks. Just 17 miles from Aberdeen in the very north-eastern tip of Scotland, Glen Garioch is the most easterly Scotch Whisky distillery not just in Scotland but the world. 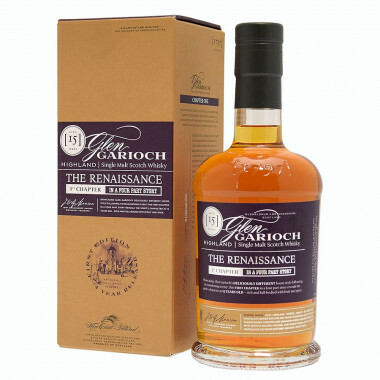 One of the oldest operating distilleries in Scotland, Glen Garioch (pronounced Geery in the ancient Doric dialect still spoken in these parts) has been making its mighty malt ever since 1797. Closed between 1995 and 1997, it is now operated by Morrison Bowmore Distillers, which is owned by the Japanese company Suntory. Shielded from the world’s prying eyes, deep in the fertile ‘Granary of Aberdeenshire’, and only ever produced in small, precious batches, Glen Garioch is a rare find indeed, but warmly appreciated by those who like a hearty Highland malt, non chill-filtered as nature intended, with a wholesome maltiness, honeyed sweetness and creamy texture. Nose: sweet and malty, with gentle woody spice. Sour lemon peel sits behind the sweetness, with toffee and hazelnuts. Palate: oily and sweet, with more nuts and toffee, as well as buttered brown toast. A little bit of tongue drying tannin, but still juicy, with baked apple and vanilla cream. Finish: butter toffee, hazelnuts, crisp apple and a touch of candied orange peel.